posted by Virginia Kropf in One Hope, Harvester Center, batavia, news, business. Sarah Veazey has always had an entrepreneurial mindset, and now that she has started her own business, her passion is giving back to the community. The name alludes to Veazey’s desire to help nonprofits achieve their goals, and every month she will choose a nonprofit organization to benefit from the profits of her wine tastings. Her business is named after a California winery. In addition, for every private in-home tasting or business-after-hours event, Veazey will donate 10 percent to a local nonprofit. 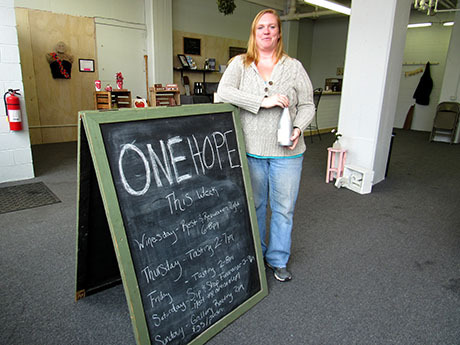 On Feb. 16, she will host a couples’ wine and beer tasting from 3 to 6 p.m. to benefit Crossroads House. “I have also been a volunteer coordinator for Crossroads House, so I know their need,” she said. A native of Oakfield, Veazey has always had a passion for wine and previously worked as manager of A Gust of Sun Winery in Spencerport. “I gained a lot of experience there,” she said. One of her goals is to have local artists exhibit their work at her business, and she already has several artists’ works on display. On Saturday, Veazey has planned a Sip & Shop from 5 to 9 p.m. to benefit the family of a Corfu girl who was born on June 20 at Golisano’s Children’s Hospital with numerous medical problems. The event will help the family with their mounting medical bills. Every third Wednesday, Veazey offers “Rest and Relaxation,” featuring massages and psychic mediums. One evening she may have gallery readings with groups. Next month she will have yoga one week. By spring, she hopes to be able to offer a soup and salad bar and, eventually, a reasonable Sunday brunch. “I’m full of ideas,” she said. Plans for Valentine’s Day include a wine and chocolate tasting. Regular tasting room hours are from 2 to 7 p.m. Thursday and 2 to 9 p.m. Friday and Saturday. Information on tickets for her events may be found on her Facebook page at Facebook.com/wnyonehope. posted by Billie Owens in UMMC, Blue Pearl Yoga, batavia, news, business. United Memorial Medical Center and Blue Pearl Yoga have joined together to bring the benefits of yoga to their employees. This week is designated as UMMC week at Blue Pearl Yoga Studio, 200 E. Main St. in Batavia. Employees who show their UMMC work badge will receive deep discounts for yoga classes, promoting the hospital’s overall intention to support their employees' health and personal wellness goals. The health benefits of yoga are very real. Much more than a trend in America, this 5,000-year-old practice has withstood the test of time, and modern scientific studies has proven its effectiveness. Yoga can increase flexibility, build strength and improve balance. There’s a vast and growing body of research on how yoga improves health concerns including: chronic pain, obesity, fatigue, asthma, irritable bowel syndrome, and high blood pressure, to name a few. Because of the mind-body connection in yoga, it is a wonderful practice for stress relief, relaxation and focus. It is essentially, self-care. Burnout is common among healthcare workers, and the hospital has offered a variety of healthy activities and tips for team members this month. The focus is on recharging and caring for themselves as they care for patients and our community. To find out about what is offered at Blue Pearl Yoga, click here. posted by Howard B. Owens in Alpina Foods, news, business, notify, GCEDC. “The Genesee County Economic Development Center in collaboration with our many public and private sector partners celebrated in bringing Alpina Foods to Genesee County in 2011. Unfortunately, due to the loss of a co-packaging contract, Alpina Foods has made a decision to close its operations at the Genesee Valley Agri-Business Park. “While this is extremely disappointing news, the GCEDC will be diligent in marketing and promoting the facility to other agricultural businesses. This was similar to our approach in marketing and promoting a former yogurt manufacturing site, which resulted in bringing HP Hood to our community and with it, further economic investment and eventually the hiring of hundreds of employees. “We are confident that we will have similar success with the Alpina Foods facility in the Genesee Valley Agri-Business Park. posted by Billie Owens in steve hawley, business, news, minimum wage. New York State’s minimum wage increased again this year to $11.10 per hour and Assemblyman Steve Hawley (R,C,I-Batavia) vocalized concern that sharp increases year-to-year are unsustainable for upstate’s struggling small businesses. Employers already face the nation’s worst tax business climate and a state regulatory code that forces more outsourcing of jobs, transition to automated labor and loss of benefits for employees. “Certainly we want to help the working poor and employees making minimum wage across the state but these sharp increases are like putting a Band-Aid on a broken leg,” Hawley said. The Assembly Minority Conference has proposed wiser economic solutions such as allowing employers to pay a training wage to new employees that is more congruent with their skill sets. Many lawmakers have also come out in support of raising the tipped wage for workers such as servers, a proposal met with animosity by the tipped workers it is meant to help. “The minimum wage was never meant to be a living wage and many employers are now mandated to pay higher costs for employees with less experience,” Hawley continued. “Employees like restaurant servers rely on the quality of their service and dedicated work ethic to bring home larger tips and an elimination of this would remove the incentive to provide quality service for these workers. “If we are to change New York’s awful business climate and stop our state’s embarrassing exodus rate it starts with tax and regulatory relief that mitigates the root cause of business struggles, not quick fixes and economic gimmicks,” Hawley concluded. posted by Billie Owens in congressman chris collins, Denying Chinese Investors Access to U.S. Small Business Aid, business, news. U.S. Representative Chris Collins (NY-27) reintroduced the Denying Chinese Investors Access to U.S. Small Business Aid bill. The bill would prevent citizens of the People’s Republic of China, who own a business, from accessing assistance offered by the Small Business Administration (SBA). U.S. Senator Marco Rubio (R-FL) reintroduced the Senate companion bill late last week. Current law permits SBA to provide assistance toward Chinese-owned business who legally operate in the United States and qualify as a small business. These businesses are allowed to obtain a federally guaranteed loan, surety bonds, research and development grants, or disaster loans. The Denying Chinese Investors Access to U.S. Small Business Aid would prohibit SBA benefits from being given to businesses headquartered in China. Under this bill, a China-based business that operates in the United States or businesses with at least 25 percent of their voting stock owned by Chinese investors will no longer be able to benefit. 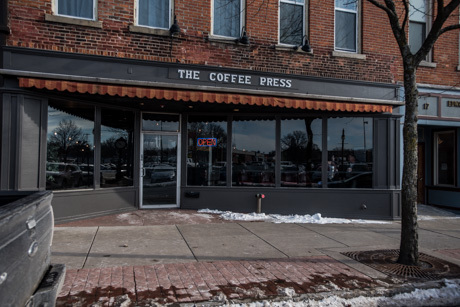 posted by Howard B. Owens in The Coffee Press, news, downtown, batavia, business, notify. 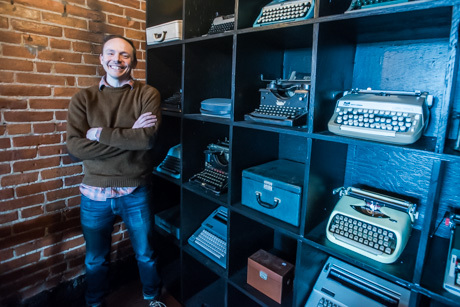 When there were no immediate takers for an empty storefront Derek Geib owned on Jackson Street, he started to think about what he could do with the space and what Downtown Batavia needed. 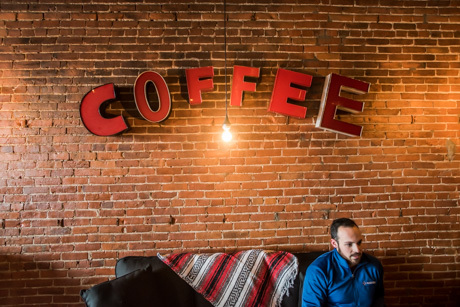 Geib, who now qualifies as a serial entrepreneur, having been an owner in Matty's Pizza, Main Street Coffee, Bourbon & Burger Co. (currently), and Casa del Taco, decided he should bring back what downtown has missed for a few years -- a community coffee shop. 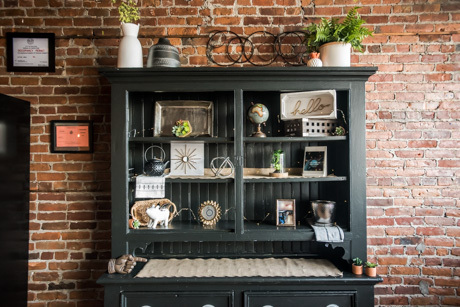 "I fixed up all the apartments upstairs and I had this space for rent but there were no bites, so I figured I might as well try to make the most of it," Geib said. "I figured it seemed like something we're missing and what we needed." 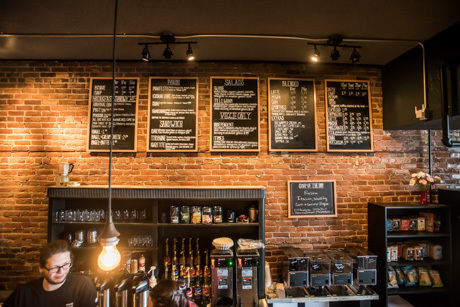 Since buying the building at 13 Jackson St., Geib said he has put his own money into renovations -- no subsidies, he points out -- and he used his own money to turn what was most recently a Mexican restaurant, an Indian restaurant, and a frozen yogurt shop into a cozy coffee shop with a place-for-community vibe. The newspaper theme is also locally inspired. Longtime residents remember Marshall's newsstand, which occupied a couple of storefront locations on Jackson from 1921 to 1999. 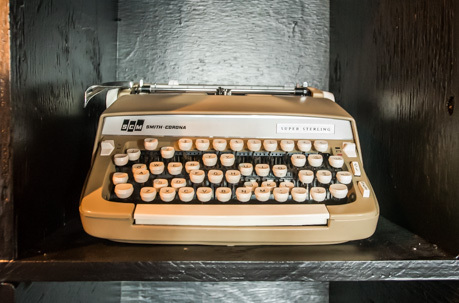 Geib said the name of the coffee shop and the decor is an homage to years two men named Arthur H. Marshall, father and son, who sold newspapers, magazines, and paperback books on Jackson, including at 11 Jackson, where Bourbon & Burger is now. Barely open a week, the word has already gotten out and The Coffee Press is attracting a crowd. "Yes, it's amazing, the support we've had from friends and family," Geib said. "And you know, now I don't know half the people coming in. I's just people spreading the word. It's really nice. 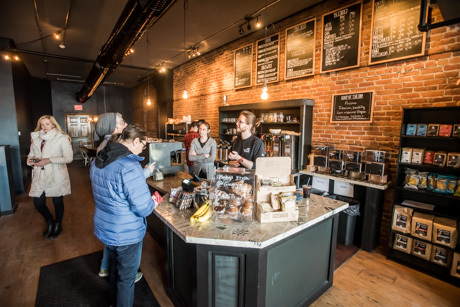 I'd like this to be known in Batavia as the hometown coffee shop." posted by Howard B. Owens in chamber of commerce, Chamber Awards, news, business. The Genesee County Chamber of Commerce is celebrating its 47th Annual Awards Ceremony which will be held on Saturday, March 2, at the Quality Inn & Suites, Park Road, Batavia. This is the County’s premier event that honors businesses and individuals for their achievements in business, community service and volunteerism. Tickets are $50 per person or a table of 10 for $450. The evening begins at 5:30 with hors d'oeuvres, entrée tables & cash bar (no formal sit-down dinner is to be served). The Award Program starts at 7 p.m. where dessert and coffee will be served. Business of the Year: Genesee Lumber Company Inc. Agricultural Organization of the Year: Upstate Niagara Cooperative Inc.
posted by Howard B. Owens in Pavilion, business, GCEDC, Churchville Fire Equipment. The Genesee County Economic Development Center (GCEDC) approved incentives for Churchville Fire Equipment Corp. at the agency’s Jan. 10th board meeting. Churchville Fire Equipment Corp. will purchase the land and build a truck setup facility at 10246 Perry Road in the Town of Pavilion. The $900,000 investment by the company, which includes $700,000 to purchase the land, will create three new jobs. Churchville Fire Equipment Corp. was approved for just over $50,000 in incentives, including sales and mortgage and property tax exemptions. For every one dollar in incentives, the company will be investing $78 into the local economy. posted by Howard B. Owens in business, graham corporation, batavia, news. Graham Corporation (NYSE: GHM), a global business that designs, manufactures and sells critical equipment for the oil refining, petrochemical, power and defense industries, today announced that it has established Graham India Private Limited (“GIPL”) as a wholly owned subsidiary. GIPL, based in the northwest region of India, in Ahmedabad, has been initiated as a sales and market development office with an Indian national as sales director and business development leader. Graham’s establishment of this new entity was driven by several strategic and macroeconomic factors. Asia is a key region for investment in new crude oil refining and petrochemical capacity, with India being an important market for such investments. The Company anticipates that stronger and more consistent consultative customer support will lead to expanded bidding participation in the region. Further, having a local presence is expected to enhance Graham’s development of India fabrication partners who can assist the Company in addressing government policy and preference for fabrication in India. Finally, Graham believes that having a local entity demonstrates its enduring commitment to the Indian refining, petrochemical and fertilizer markets. 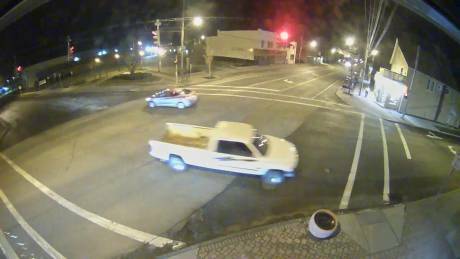 posted by Billie Owens in crime, news, notify, batavia, business. 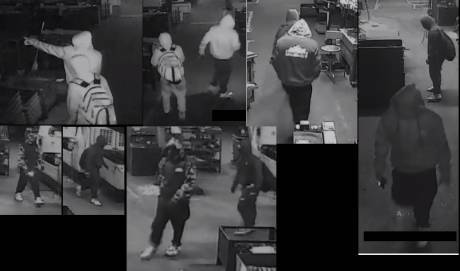 The Batavia Police Department is investigating several burglaries which occurred at different local businesses over the weekend. The areas where the burglaries took place are Ellicott Street and Jackson Street, Harvester Avenue, Swan Street, Center Street, Apollo Drive and Liberty Street. The suspects broke windows or kicked in doors to gain entry. Items were taken at some of the businesses but not all. 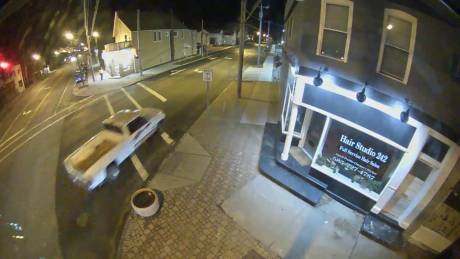 The suspects stole a white 1998 Dodge RAM 2500 diesel (NYREG 65962JX) from one of the businesses and may be operating the vehicle. Attached are photos of the suspects from one local business and the actual stolen vehicle. It is recommended that business owners remove all cash/valuables prior to closing. The Batavia Police Department is requesting business owners and citizens to look out for suspicious persons. Please notify the police department IMMEDIATELY if suspicious activities are observed so investigative actions can be taken. No other information will be released on the burglaries at this time due to the ongoing investigations. posted by Billie Owens in Stafford, news, business, original red osier landmark restaurant, braille, ILCGR. The Genesee Regional Advisory Council (GRAC) for people with disabilities at the Independent Living of Genesee Region Center with assistance from the NY School for the Blind have brailled the Original Red Osier Landmark Restaurant menu. The Red Osier, located in the Town of Stafford, has made a significant commitment to being an accessible restaurant to all members of the community regardless of abilities. 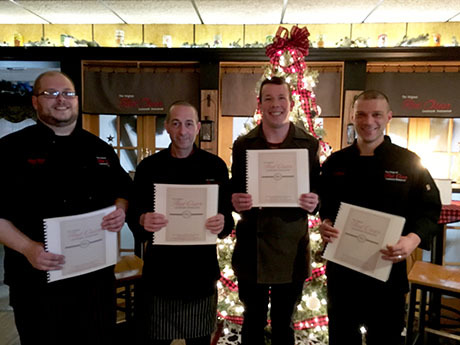 Pictured from left: Executive Chef William Burch, Chef Mike Mattern, David Dodge from the Independent Living of Genesee Region Center and The Original Red Osier Landmark Restaurant Owner Steve Foster. posted by Billie Owens in Tompkins Bank of Castile, business. In a strategic effort to support its growing team in Western New York, Tompkins Bank of Castile is opening its first Erie County branch today at 1 Hopkins Road in Amherst. This location is a full service branch of Tompkins Bank of Castile, as well home to partners from Tompkins Insurance Agencies and Tompkins Financial Advisors. Plans for the branch have been in the works for the past two years, as Tompkins officials researched and identified a prime location, and recruited experienced financial professionals to join the growing the team. The nine-person Buffalo staff has been working out of a temporary office while renovations were made to the 5,000-square-foot space, formerly a medical office, at the corner of Hopkins Road and Sheridan Drive. A grand opening is being planned at the new location to coincide with Tompkins Bank of Castile’s 150th anniversary this spring. Plans are also underway to add more branch locations in the region. posted by Howard B. Owens in farm bill, agriculture, NY-27, chris collins, business. Congressman Chris Collins (NY-27) celebrated the passage of H.R 2, the Agriculture Improvement Act of 2018. H.R. 2, which includes critically important dairy policy reforms that will strengthen and grow the Western New York dairy economy that in recent years has faced significant challenges. H.R. 2 provides greater coverage to dairy farmers through the Margin Protection Program (MPP), and will allow farmers to participate in both the livestock and dairy protection programs. Additionally, the program will be rebranded as the Dairy Margin Coverage (DMC) Program. This legislation will also help strengthen trade enforcement, promote the research and development of specialty crops, ensure funding to help farmers locate new global markets, significantly increase investment in organic research, and offers cost-sharing assistance to help farmers transition into organics. “Today’s final vote for the 2018 Farm Bill is a major victory for New York’s farmers, rural communities and consumers. Farmers needed stronger risk management tools in place moving into next year where there are signs that the economic stress will continue in the farming community. In particular, the new Farm Bill enhances the dairy safety net for farms of every size, including increasing the margin that qualifies for federal insurance programs. New York Farm Bureau also appreciates the research and support programs in the bill that will benefit New York’s specialty crop producers. Having some certainty moving forward in challenging times is a relief for farmers. In addition, the Farm Bill supports critical conservation programs, rural development projects, and marketing and research programs to expand market opportunities for farmers. It legalizes industrial hemp, which will benefit farms interested in diversification. And the legislation provides permanent funding to help veterans and a new generation of beginning farmers. The biggest portion of the Farm Bill also guarantees Americans, who can least afford to eat, the ability to access the food farmers produce. posted by Billie Owens in business, agriculture, CDL. Cornell Cooperative Extension of Genesee County, in collaboration with Genesee Valley Educational Partnership, will be offering a CDL Training Program for Genesee County agriculture producers and their employees for Class A and Class B licenses. This training program is designed for producers and farm employees that have some experience with commercial truck operation. An informational meeting will be held on Jan. 31 at 7 p.m. at the Cornell Cooperative Extension building at 420 E. Main St., Batavia. This meeting will explain how the program works and answer any questions you may have. The required training materials and medical forms will also be passed out at this time. Classroom instruction dates are Feb. 6 and 7, from 7 to 9 p.m., at the Cornell Cooperative Extension building located at 420 E. Main St. in Batavia. Drive time will be scheduled with the instructor at a later date. posted by Howard B. Owens in farm bill, agriculture, business, Charles Schumer. U.S. Senator Charles E. Schumer today revealed the details of the newly released 2018 Farm Bill, Conference Report, which passed the Senate by an overwhelmingly bipartisan vote of 87-13 yesterday. Schumer said the bill will benefit key Upstate New York agricultural communities. Senator Schumer detailed several major areas in which the Farm Bill will be a major boost to Upstate farmers, growers, food-needy families and producers, as well as other New York businesses. Schumer said the newly announced bill reflects a variety of different priorities he pushed for on behalf of the New York agricultural community. Schumer explained the bill will give New York's agricultural industry a shot in the arm. Schumer lauded the months-long bipartisan process to craft the Farm Bill and congratulated committee leaders Sen. Debbie Stabenow and Republican Chair Pat Roberts, as well as Committee Member Sen. Kirsten Gillibrand for their assiduous work. “The Farm Bill is a major victory for Upstate New York and its large and vital agricultural community,” Schumer said. “Ensuring the passage of a Farm Bill is vital for New York’s agricultural community and our economy as a whole. "The bill makes further investments to help Upstate New York dairy farmers, boosts the rapidly growing organic sector, builds on New York’s burgeoning industrial hemp industry, expands rural broadband, strengthens crop insurance, and protects our most vulnerable hungry families and seniors from harmful cuts. "While the bill does not contain everything that we fought for, it is ultimately a win for the farmers that are the heart of Upstate New York." The newly introduced Farm Bill includes major victories for Upstate New York dairy farmers and producers. The newly introduced Farm Bill invests in programs to help give much-needed relief to Upstate New York dairy farmers and producers. The Farm Bill includes a variety of helpful reforms including, an investment of $100 million to help improve the Federal dairy insurance program to help make the program work better for small to medium dairy farms, a provision waiving administrative fees for beginning, veteran, and underserved farmers, a provision continuing the vital changes made in the Omnibus Budget bill that allowed for the creation of new dairy insurance tools in the future, and a program that would provide funding to dairy organizations who chose to donate their products. This Farm Bill focused on investing in our small rural communities across New York State and nationwide. 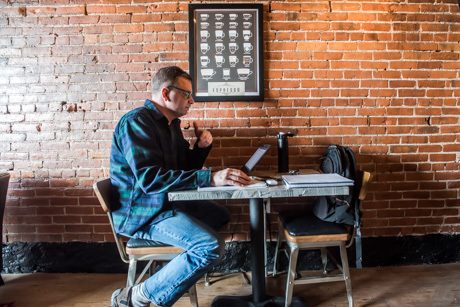 One example of this was the establishment of a new grant program that will target high-need, rural areas seeking to undertake broadband internet projects. These projects will help connect our most in need areas and upgrade to more modern internet access. Additionally, the Farm Bill made important investments in programs that help grow our rural small businesses, as well as those that help to fight the opioid crisis. The newly introduced Farm Bill establishes mandatory funding of $24 million over FY19-23 for the National Organic Certification Cost-Share Program (NOCCSP), which helps support farmers who want to become involved in the organic market by providing reimbursements of some of their annual fees for United States Department of Agriculture organic certification -- it includes an increase in critical funding for organic research through the Organic Agriculture Research and Extension Initiative from its current level of $20 million to $50 million by FY2023. Finally, the Farm Bill increases the authorization for the National Organic Program (NOP). Schumer has been a major supporter of this program that helps USDA protect farmers from having to unfairly compete against fraudulent organic imports while also helping to maintain consumer confidence in the USDA certified organic brand. This bill increases the authorization for the NOP to $16.5 million in FY2019, $18 million in FY2020, $20 million in FY2021, $22 million in FY2022, and $24 million in FY2023. The Farm Bill contained a number of provisions beneficial to Upstate farmers, but especially to farmers of specialty crops. New York produces a wide range of specialty crops (fruits and vegetables, tree nuts, dried fruits, horticulture and nursery crops, herbs and spices, maple syrup, Christmas trees, etc.) that rank highly nationwide in terms of both production and economic value. The Senate Farm Bill, according to Schumer, provides vital funding to key programs that aid specialty crop producers, such as the Specialty Crop Block Grant Program and the Specialty Crop Research Initiative. These programs help provide support to New York's specialty crop industry in the form of robust research funding. The Farm Bill reauthorizes Schumer’s original legislation known as The Maple Tap Act, which Schumer said is now officially called the Acer Access and Development Program. This provision will continue to help maple producers in the Hudson Valley and across Upstate New York boost their production and become more competitive with places like Canada, which produces 85 percent of the world's maple product. Schumer said, specifically, this provision provides an authorization for USDA grants to states that create programs to encourage individual and private landowners to open up their trees to maple tapping. Schumer's legislation would also provide grants to states to support market promotion, maple industry research and development, and education through leading institutions, like Cornell. Most importantly, Schumer said this important provision would allow for New York’s agricultural community to grow industrial hemp as an agricultural commodity if they so choose, allowing New York growers more flexibility. The Farm Bill requires the USDA National Agricultural Statistics Service to record all barley production in New York State. By ensuring that this critical information is accessible for barley farmers, they will be able to better determine any future plantings. Additionally, the provision would give crop insurance providers access to this essential information, which could spur them to expand coverage and potentially even offer a malting barley endorsement. Schumer explained that he fought tooth and nail to protect SNAP from any cuts in the Farm Bill. Schumer said that he also was able to push for other provisions to help those most in need. First, the Farm Bill creates opportunities for job training for some of the most in-need New Yorkers who participate in SNAP, to help them find and keep good-paying jobs. Second, the Farm Bill simplifies paperwork for New York seniors who participate in SNAP to ensure they get the nutritional assistance they need and deserve as quickly as possible. And lastly, the Farm Bill creates the “Farm to Food Bank” initiative, which will help provide New Yorkers using SNAP with locally grown, New York produce and other food. Schumer said the Farm Bill funds key environmental programs that are essential to farmers, like the Environmental Quality Incentives Program (EQIP) and the Regional Conservation Partnership Program (RCPP). These programs are voluntary conservation initiatives that farmers can utilize through the USDA’s Natural Resource Conservation Service (NRCS) to help them continue to be good stewards of the land. The newly introduced Farm Bill also includes a vital provision called the Pet and Women Safety Act (PAWS) Act, which Schumer is currently a cosponsor of. This bill would help give victims of domestic violence and their pets greater access to safe sheltering options, as well as provide stronger legal protections to pets. According to the Humane Society, up to one-third of domestic violence victims delay leaving a dangerous situation, because they fear for the safety of their pets, and up to one-fourth return to an abuser due to concern for their pets. The Farm Bill creates a new Local Agriculture Market Program (LAMP) by combining the Value Added Producer Grants Program and the Farmers Market and Local Food Promotion Program. The value-added producers grant program helps dairy farmers that start producing artisanal cheese or apple growers that enter the hard cider industry. The grants administered through the new LAMP program will continue to support strengthening our local food systems from rural farmers to urban consumers. The Farm Bill provides funding to support and strengthen rural water infrastructure. Funding to Rural Development programs like the Water, Waste Disposal, and Wastewater Facility Grant program will help families and businesses across Upstate New York and nationwide continue to have access to clean drinking water. The Farm Bill supports Community Facility investments to continue to help provide resources to construct hospitals, improve schools, while also improving fire and police stations across small towns in New York State.